Home whitening is a method of professional teeth whitening, which the patient carries out at home, after a previous visit and consultation with the dentist. Home/night whitening is a completely safe method, which effectiveness reaches up to 90%. It allows teeth whitening with several shades in a few days. Home whitening removes discolorations only from teeth – all fillings, restorations (eg veneers) and crowns do not change their color upon this procedure. Therefore, it is recommended to apply home whitening before making final white fillings, crowns or veneers in order to match their color to one achieved after the tooth whitening treatment. To obtain the best effect of home whitening you need to wait 14 days after the treatment to guarantee the optimal time for the color of the teeth to stabilize. Home/night whitening begins at the clinic, where we take a patient’s jaw impressions. 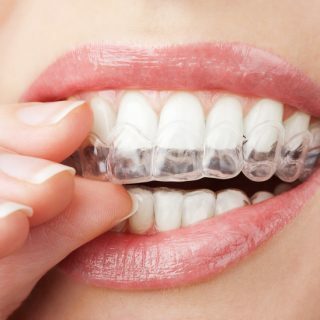 On the basis of the impressions, the patient receives celluloid, individually made overlays with profiled reservoirs for Opalescence whitening gel. These overlays the patient puts on at the night. The dentist instructs the patient how to properly do this: the gel should be applied to the inner surface of the front walls of the overlays. Patients, after proper training, apply the whitening gel to the overlays at home. This method is recommended for whitening the living and dead teeth. What is the effect of the treatment? After the treatment, the teeth are whitened even by a few shades. Whitening lasts from 7 to 10 days, and the effect lasts for about 2 years (depending on the diet, oral hygiene and smoking). Prosthetic restorations (eg. crowns and bridges) and white fillings remain unchanged. If necessary, after the color stabilizes (which usually lasts from 10 to 14 days), the dentist can replace the restorations (crowns, fillings, veneers) by selecting the appropriate, lighter color. During teeth whitening, a few percent of patients experience temporary hypersensitivity of the teeth, which disappears within 1-3 days after the end of the treatment. the patient decides on the level of teeth whitening by regulating the time of the procedure. it is recommended to be very careful when doing the procedure yourself, because if you carelessly use the whitening gel, there is a risk of burning the oral soft tissues.